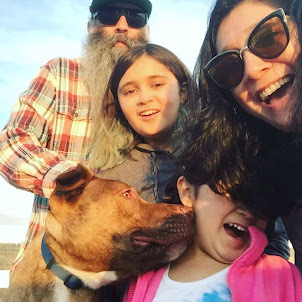 About a month ago we had planned a trip out to San Luis Obispo with my HerMamas co-creator and dear friend Irene, her husband Diego and their 3 beautiful babies. Well after our car accident on Super Bowl Sunday, we had to cancel the trip. Then my brilliant husband came up with a great idea, why don't we all spend the weekend up at my parents in Santa Barbara. I asked my parents if they were okay with us all invading their home. They loved the idea too. So over the long weekend we talked, we ate amazing food, we played poker, we went to the zoo, and just got to spend some amazing quality time together and the Quevedos got to know what ranch life is all about. We even got some work done too. We are pretty efficient like that. They were able to hang out with my parents and get a better idea about where I come from and why I am the way that I am. Finding friends has never been really easy for me. And the ones that I do surround myself are truly amazing people. How often do you find not just an amazing friend for yourself, but an amazing family that fits perfectly with your own family? I am guessing not very often. We can't wait for our next HerMamas Family Retreat! And a very big giant thank you to my Mom and Pops for being the amazing hosts that they always are. I love the slide show. We've made friends with a family too that we get along with so well and their kids are great friends of our kids. It really does feel like you won the jackpot when that happens.